As mentioned before, I do try to make a little money with my website. Generally speaking, I'd like to think I break even with my running costs VS earnings, but I expect that to change one day. In the mean time, I'll continue to casually share my interest and promote products I think are either good or promising. In this case, it's promising! If you're like me, you've got a bunch of things hooked up to your PC that are only used when the PC is on. Unfortunately, so long as electronic devices are plugged in, they're almost always drawing a small current. With this USB power supply I'm about to link to, when your PC is off, it will totally switch off power to peripherals. For me that could mean my printer, dual-monitors, computer speakers, external hard drive, and cable modem. I say "could" in the previous paragraph because realistically speaking, I want to keep my printer on since it's wireless and my wife uses it with her laptop and I want to keep my modem on because we have a wireless network requiring the cable modem in use even when my main PC is off. For me it translates to saving power by eliminating current to my monitors, speakers & external hard drive. Is this all worth $60? Honestly, I don't think that feature itself is worth $60 bucks, but when considering the price of a good power strip is $20-$40, the extra price for this one I think is worth it. It may take years to get the extra money back, but I'll be reducing energy waste. Whether you believe in global warming or not, excess waste is not a good thing, though of course some is necessary, so we can feel good about this purchase. Concerns: Since I haven't purchased this yet, I can't say what kind of stress directly switching off the power to devices many times a year may have on them. I had a usb headset once that for necessity I had to constantly plug in and out and one day it shocked my head, then another day, then another. You'd think I'd get the hint eh? Well, eventually it melted so I actually took it to the store and swapped it out for the same one. The guy at Radio Shack had the nerve to allude to me me "it's common sense to unplug usb devices before power down or turning a PC on." Interestingly enough, my theory is unplugging it and plugging it in was the main contributor to the devices failure. 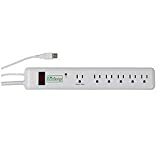 Luckily for this power strip, things that rely on a dedicated power source, indicated by a separate cord specifically for power are usually more attuned to power issues. You may notice many usb devices state to use only their usb power cords to charge their devices and I think sometimes they say to charge it in a PC [and not something like a PS3/PS2, Wii, Xbox, general usb wall outlet (which are awesome by the way)]. If you have any experience with an auto-off/auto-on power controller for PC peripherals, let me know what you think! Unless I'm discouraged too much, this will very likely be my next power strip (or one very similar). P.S. I'm secretly working on a redesign of this website. Finally gravitating to CSS. Sadly, tables are still concrete while CSS may still be a mud hut for a years... An exquisite mud hut, but a mud hut none the less. In fact, I may end up using some tables still, but slap so much mud over them that they'll look smooth and natural. Who knows, I might even grow a tomato or something. 1) It's so inconvenient, people won't do it. 2) The small loss of electricity for stand-by appliances cost such a tiny cost, the majority of people won't care. 3) Who wants buys a $60 power strip anyway? Energy is now the current economic bubble. One day it'll burst and I hope my 401k is not in these ventures. Hosted by HostNine This page was created in 0.00316715240479 seconds.